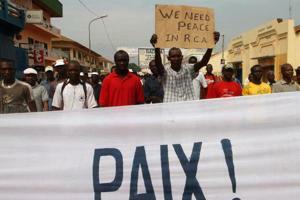 Traders demonstrate near the presidential palace in Bangui January 5, 2013. Bishops in the Central African Republic (CAR) have called for a ceasefire and the opening of a humanitarian corridor after a month-long revolt by rebels. The bishops’ voices join that of Pope Benedict, who urged for a return to stability in the country earlier this week. Caritas staff on the ground report pillaging and occupied villages, while many people have been displaced by fighting in central and northern CAR. Over a hundred people are reported to have been killed. While people were attending midnight mass in Kaga Bandoro on Christmas Eve armed men came and ransacked public buildings and destroyed the archives before occupying the town. Peace talks have been taking place in Gabon between the Government, the opposition and Seleka, a confederation of rebel groups. The rebels, who had taken control of the north and east of the country, are asking Mr Bozize to step down. The bishops from the Justice and Peace commission are asking the rebels to withdraw, the Government to protect the population, the presence of observers and journalists to ensure that resolutions from peace talks are enforced and ask the international community to strengthen a multi-national force present in the country.